Is an efficient steam-based process developed for creating hi-gloss mirror-like surface finish, often called Piano-Key Black with black resins. This ultra smooth surface finish has nearly invisible weld lines and sink marks. The high temperature keeps the resin in a liquid state for better flow properties. The mold is then rapidly cooled to allow the part to solidify to maintain a short cycle time. This process keeps production costs low since maintaining the mold at high temperatures isn't necessary. Our four factories have a range of machines to suit all of your processing needs. Machine sizes range from 55 to 2500 metric tons and can process high-gloss plastic parts quickly and efficiently. Every machine is equipped with a robot to safely and carefully remove each part after each cycle. Innovations from Kyowa America include molding speaker grills into television cabinets, creating an all-in-one frame. Speaker grills are made of extremely thin material, with many tiny holes to transmit sound. Some of the benefits of this process include reduced assembly costs and the elimination of vibration. These skills can be applied to different designs to minimize weight, reduce material used, and to create fine-featured, complex designs. Kyowa America is an industry leader in advanced gas-assist molding technology. The gas-assist process provides several advantages over other molding methods. Reduces sink marks, Reduces weight, Faster shot cycle, increasing productivity and lowering costs, Lower injection pressure, extending tool life and Ultra-micro hole injection is possible. Kyowa uses Autodesk MoldFlow Plastics Advisor software for mold simulation. This allows us to refine part design to optimize the flow for the most efficient molding process - all before any metal is cut. This allows us to reduce defects and improve appearance to ensure the highest quality and most economical part possible. 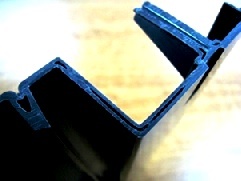 In-mold Decoration, also known as Film Insert Molding (FIM), is a versatile and cost effective method of decorating and manufacturing durable plastic parts without complicated painting techniques. IMD allows the part to be decorated in different colors, effects, and textures during the molding process. The part appearance and/or texture can be dramatically altered by simply changing the film. To see an example, please look at our decorating page. This process involves placing a rivet or other fastener inside of the mold to be molded into the plastic part. This allows hardware and other features to be encapsulated in the mold for maximum strength. 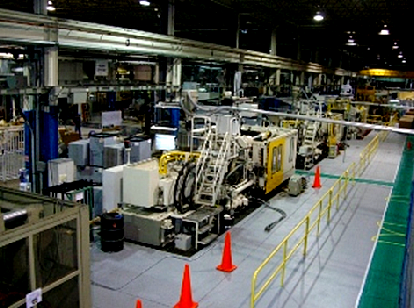 Kyowa's molding facilities use a real-time production and process monitoring system to provide detailed and precise information from the manufacturing floor. The information gathered and maintained includes: scheduling and production data, engineering data including support of intra-cycle profiles and SPC analysis, variable and attribute characteristic data for SPC analysis, mold and machine maintenance data to support preventive maintenance programs.